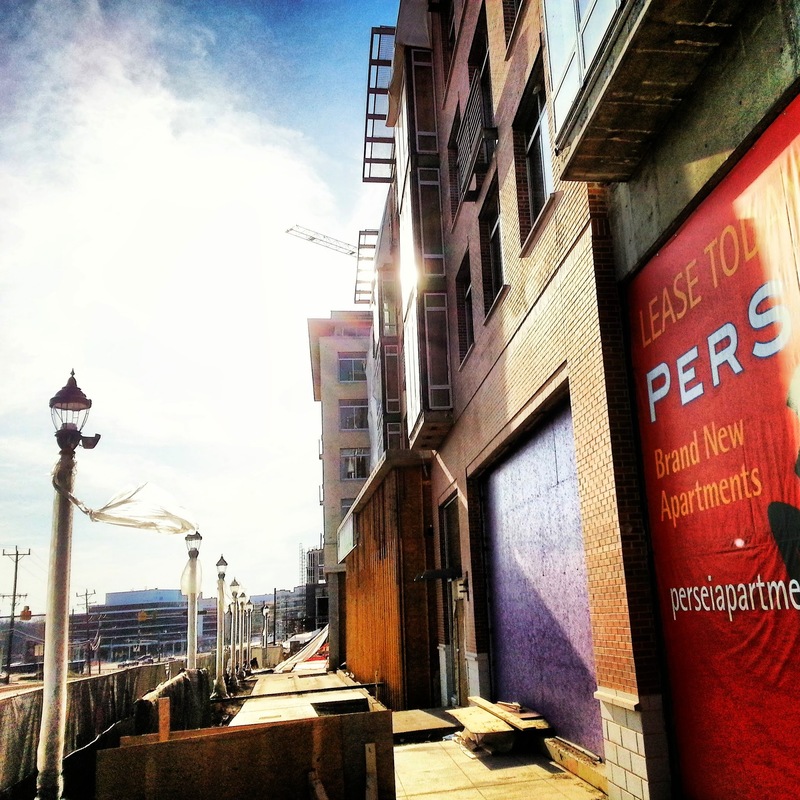 The new Rockville location of Pier 1 will be in the Pike Center, at Rockville Pike (MD 355) and Bou Avenue. 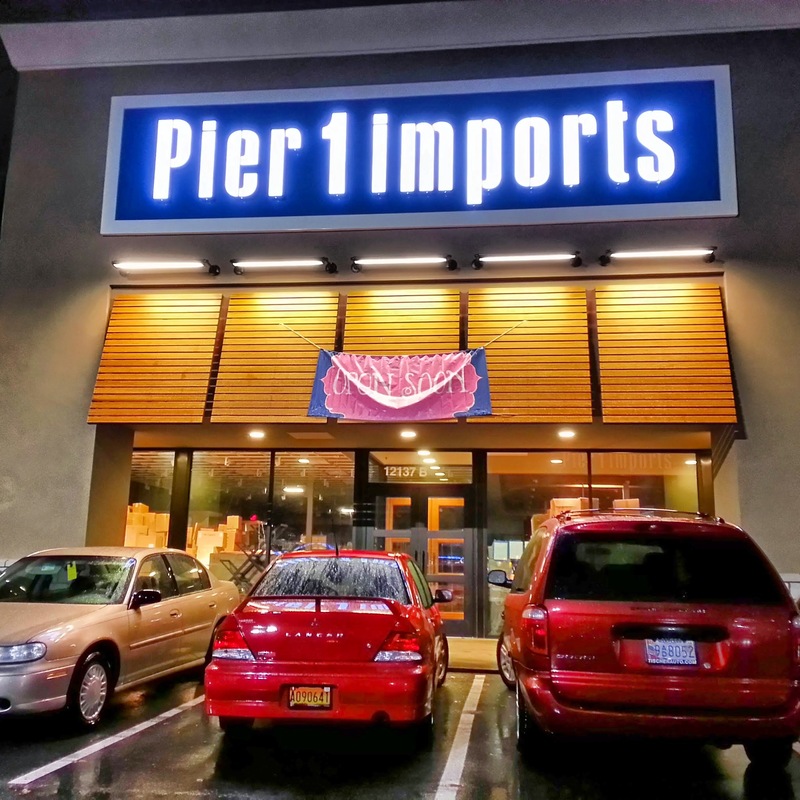 Pier 1 was forced to close its old location at 1590 Rockville Pike, after being displaced by a pending "town center"-sized mixed use project. That project is also forcing Fuddruckers and other businesses out of their existing locations. Currently, the store is filled with boxes and crates. But a banner out front says, "Open Soon." The lights were on inside Saturday afternoon. Taco Bell Breakfast is here, and here is my first review from the menu! The Waffle Taco is available in Egg and Cheese, Sausage or Bacon versions. I chose to start with the sausage version, which has a sausage patty, scrambled eggs, and cheese wrapped in a warm waffle. A packet of maple syrup comes with it, for dipping purposes. How has the Taco Bell breakfast experiment turned out? Watch my detailed review and find out! I also give an update on the Taco Bell Breakfast Phone. Theft. 11800 block Parklawn Drive. Theft. 11700 block Parklawn Drive. Theft. 12100 block Rockville Pike (near Bou Avenue). Drug arrest. 12500 block Twinbrook Parkway. Theft. 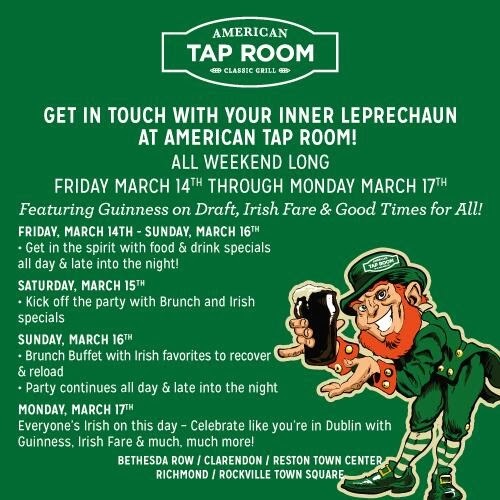 1400 block Rockville Pike (just south of Woodmont Country Club). Drug arrest. 2900 block Tower Oaks Boulevard. Would you buy a car sight unseen, if the salesman said he could only tell you it was a 4-door sedan? Rockville residents are being asked to comment on the draft update of the Rockville Bikeway Master Plan at a public hearing on April 9. But critical information is missing from the draft, according to Rockville Planning Commissioner Jack Leiderman. 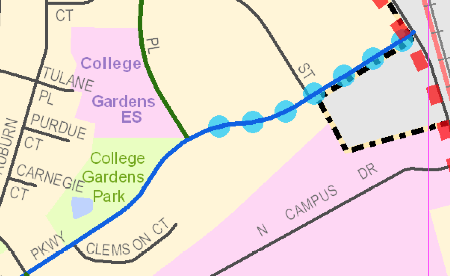 While the document illustrates many common on-road bike facilities, and lists a recommendation for specific roads within Rockville, Leiderman noted that residents have no way to know how the proposals will affect parking, the width of existing travel lanes and other relevant details. Andrew Gunning, the city's assistant planning director (and staff liaison to the planning commission) said planners hadn't gone into that level of detail at this stage. "I'm requesting it," Leiderman responded. "How am I going to comment" on the plan without knowing the details, he asked. This situation is virtually identical to that of the recent Montgomery County Transit Corridor Master Plan process. With relatively few details worked out on the specific design and traffic impact of the county's proposed bus rapid transit system, the plan was rammed through by the council, with promises that the details would be known later. But if some of the potential impacts were untenable, why would a citizen allow the BRT Master Plan to pass? The same applies to the bike plan. Should the plan be approved, it will become the document that can be referenced to justify a wide range of changes to city roads. Once adopted as a master plan, those changes - like BRT - will become "a fait accompli," as Leiderman put it Wednesday night. 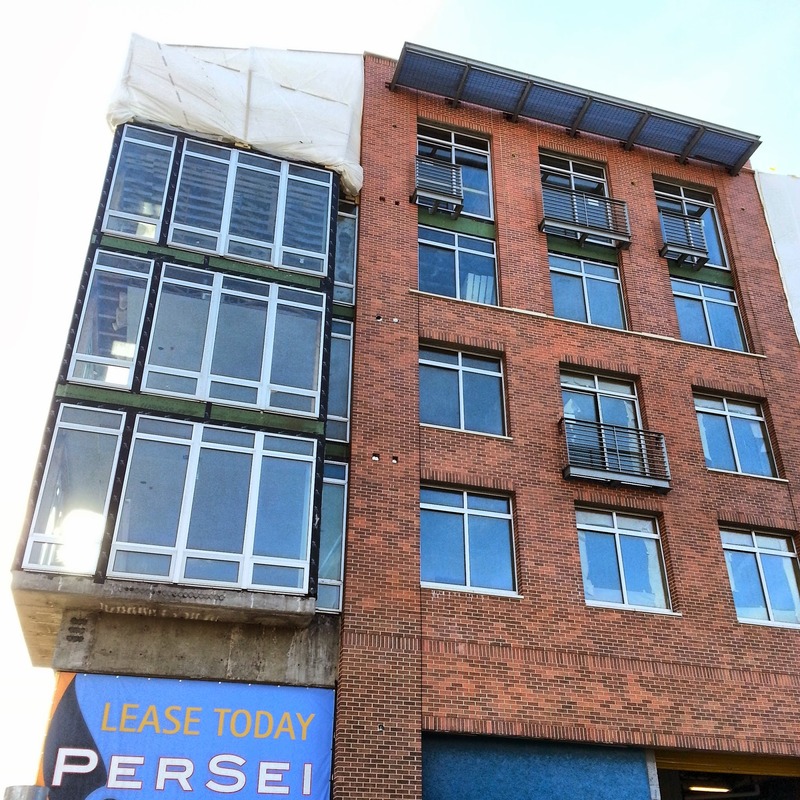 "I'm not just going to rubber stamp a list of streets," Leiderman said. Also at Wednesday night's meeting, Planning Commission Chair Don Hadley discussed his upcoming appearance before the Mayor and Council at their April 7 meeting. Hadley invited his fellow commissioners to attend, but said he has not yet been informed of the format of the discussion. Commissioner John Tyner somewhat jokingly suggested Hadley review the comments of Councilmember Tom Moore on the topic prior to the evening. Moore was critical of the commission's pace last week. Leiderman advised Hadley to emphasize the importance of taking time to get the plan right: "Measure twice, saw once," he said. Less than 17% of Rockville voters bothered to vote in last November's city elections. That has been accepted as fact for the past two Rockville elections. 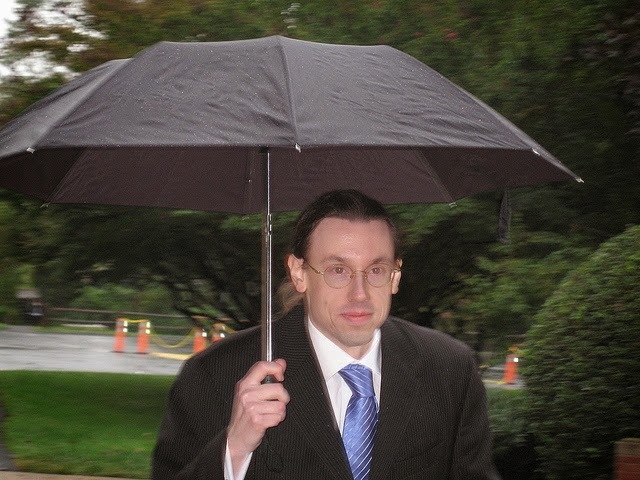 Not so fast, warned former Rockville councilman Jim Marrinan at Monday's Mayor and Council meeting. "Flat out, the actual percentage of Rockville residents voting in the last election was higher than the reported" number, Marrinan said during the Community Forum portion of the meeting. The problem, Marrinan said, is that too many ineligible voters remain on the Rockville voting rolls. Marrinan gave a personal example - his own adult daughters are still on the eligible voter list in Rockville, despite not being residents. Brigitta Mullican, a former candidate for mayor and council, previously commented on Rockville Patch that she encountered a number of inaccuracies in the current voter rolls, while campaigning door to door in the city. The discrepancies may be making Rockville voters sound more like slouches than they actually are, when it comes to exercising their right to vote. Marrinan still believes the actual number could use a boost. He suggested adding early voting for city elections. Marrinan's proposal to lower the cost of such voting, would be to have it on the Saturday prior to election day, from 8:00 AM - 5:00 PM. In the meantime, Rockville, don't feel so bad about your voting record. The "number of ineligible voters on our eligible voter list is quite high,” Marrinan said. Responding to Marrinan's advice to clean up the voter list and add early voting, Mayor Bridget Newton said, "I actually agree with you on both points." Newton added that her non-resident son remains on the eligible voter list, as well. Is the Rockville Planning Commission taking too long to produce the final draft of a new Rockville Pike Plan for approval by the Mayor and Council? The answer varies among city elected officials. Councilmember Beryl Feinberg brought up the issue at the March 17 Mayor and Council meeting, under the Future Agendas item. 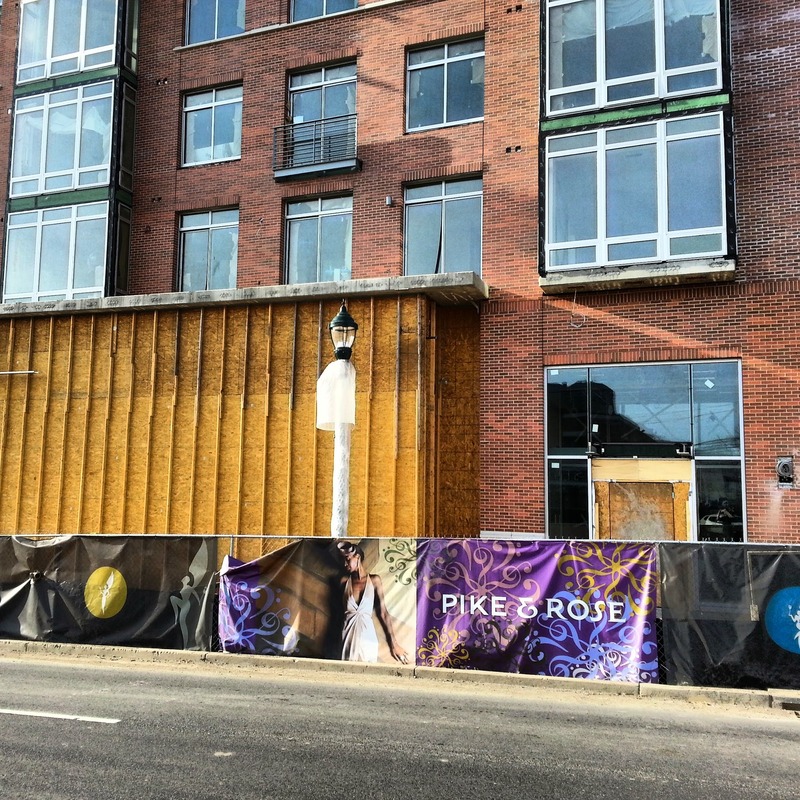 Feinberg requested that an update on the commission's Pike Plan progress be scheduled for a future meeting, saying that - in her view - "it's been stalled." Mayor Bridget Newton said her perception is directly the opposite. "I don't think it's stalled at all," Newton responded, adding that the "Planning Commission has been working hard on that." "They have had this plan for years," Councilmember Tom Moore countered. Moore said recent decisions by the commission to further study some elements of the plan "alarmed some of us." Several councilmembers reached a consensus that summoning Planning Commission Chair Don Hadley to provide an update at a future meeting would be satisfactory. Feinberg said she is seeking a "timeline for completion," and the ability of the council to "have our input to what's going on." 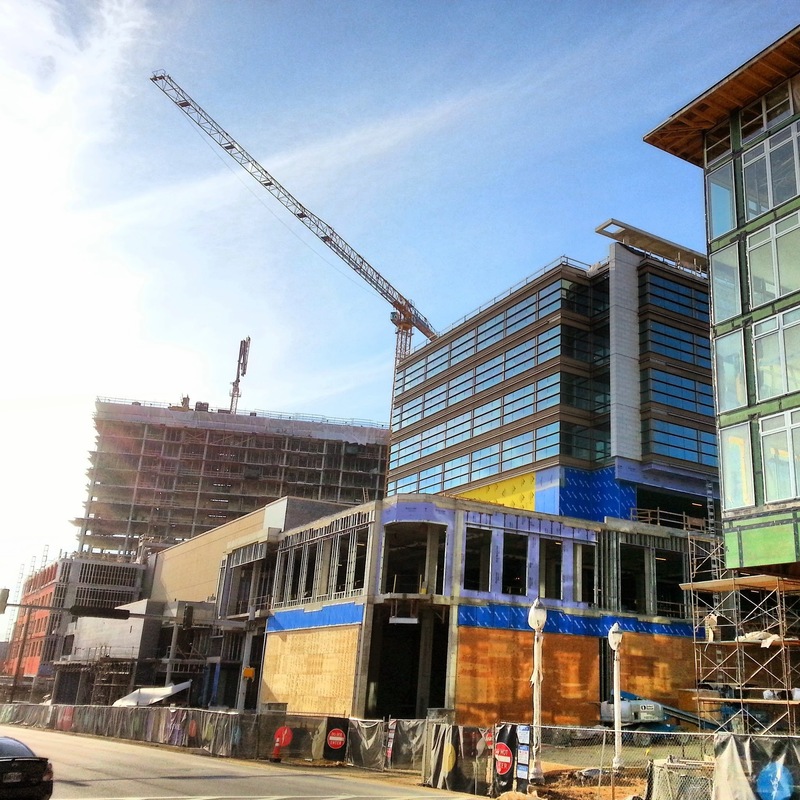 "What's going on," of course, is really more a projection of underlying tension between factions, with very different visions for future development in the city of Rockville. It's also an interesting study in the specific power, and influence, the office of mayor holds in the city. 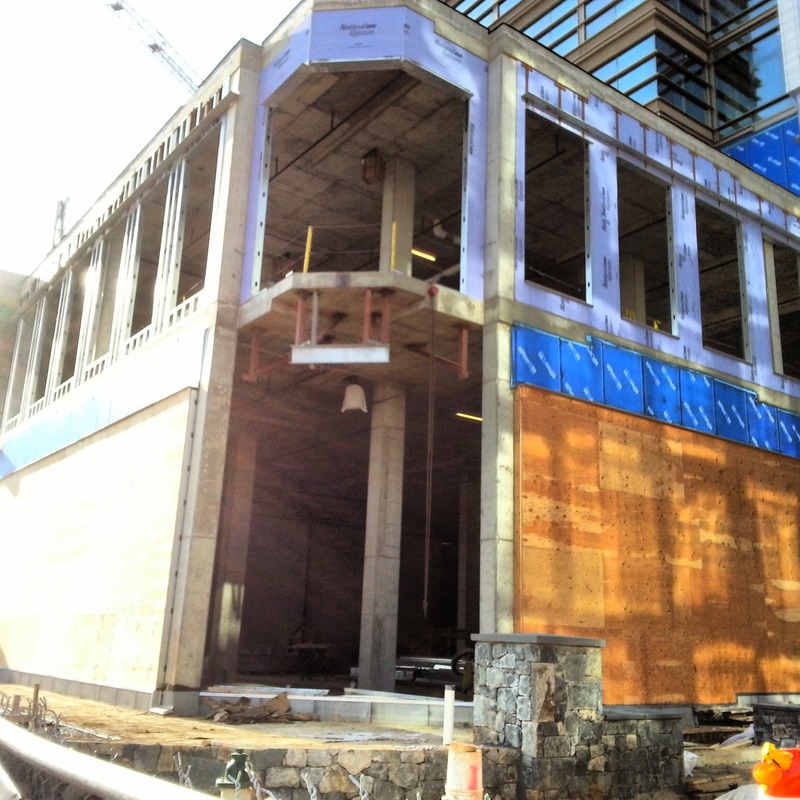 While the outcome of November's election appeared to favor the more pro-development Team Rockville faction, the ability of a mayor to strongly influence the makeup of commissions can allow him or her to still have a significant impact on major decisions. Choices made by former mayor Phyllis Marcuccio have had just such an impact on the Pike Plan, and the process. When the plan process was, indeed, started "years" ago, there was a much more favorable majority for a high-density plan on the Planning Commission. There was a sense that the process was, if anything, moving too swiftly for some at that time. 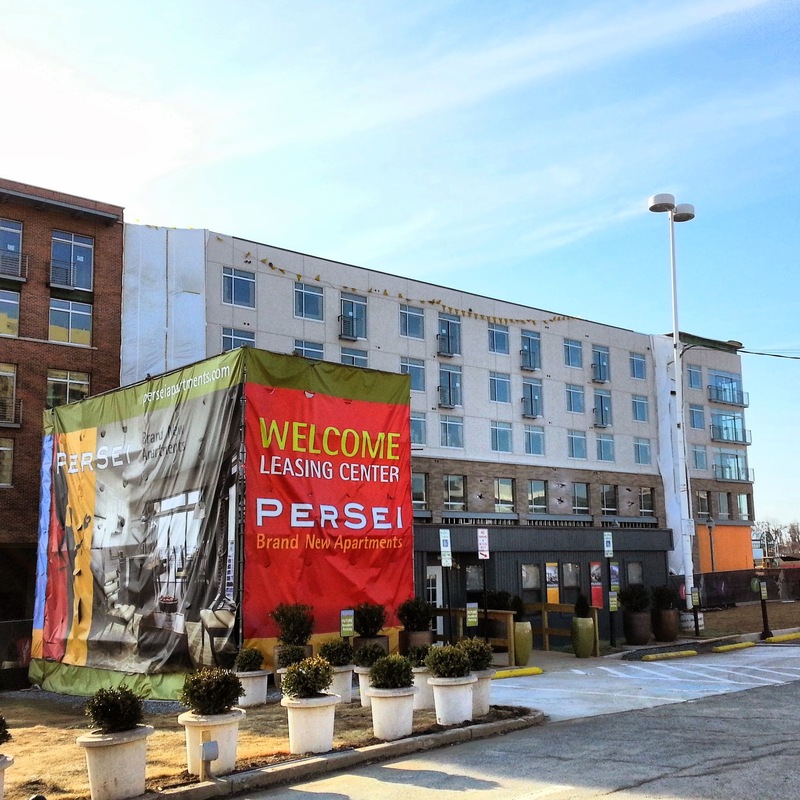 But with the exception of Jerry Callistein, Marcuccio's approved nominees have taken a decidedly more skeptical view of whether or not Rockville should rush to be just like White Flint. 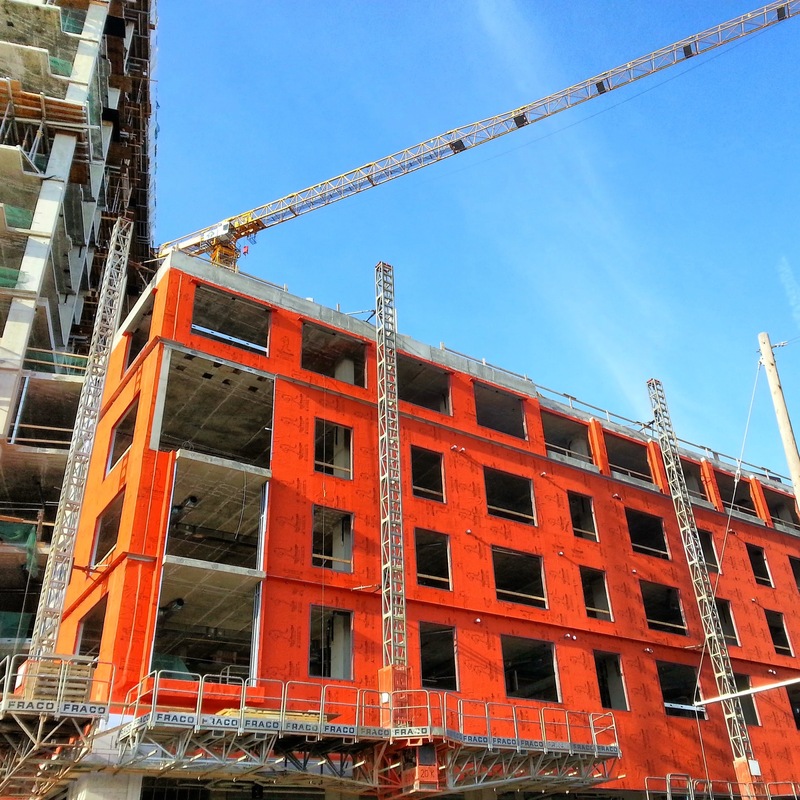 Not only have the originally-proposed building heights come into question, but aspects of the plan glossed over by the well-paid consultants - and in the initial discussions - have come under more scrutiny. Hadley took a deliberate, thoughtful approach as a commissioner, and his elevation to chair has permitted the commission to operate in a similar fashion. New commissioners Jack Leiderman, Charles Littlefield and Anne Goodman have brought a fresh approach. Leiderman in particular has convinced many colleagues, and even city staff, to question points in the draft plan that had previously just been accepted as fact or fate. And many more of the concerns raised by the majority of citizens, who opposed the draft as written, have been taken into account. As a result, the plan that will be sent to the council will be notably different than the one many had expected to be approved by 2012. While at this point still far more urban than today's Pike, many fairly radical proposals have been scaled back. A plan that will have major impacts on the city, and particularly upon the neighborhoods that border the Pike Plan area, deserves a thorough process. With White Flint's radical changes still unproven to be financially sustainable or wise planning, there's no urgent need to rush completion of this document. Taco Bell sent me a special package: a Taco Bell Breakfast Phone! As you've probably heard, Taco Bell is launching breakfast nationwide this Thursday, March 27. Let's open the package, and see what the Breakfast Phone is all about. Apparently, Taco Bell will be sending text messages and voicemails with "secret missions" to carry out, related to the Taco Bell Breakfast theme. What other surprises does the phone have in store between now and Thursday? Stay tuned, because you know as much as I do. The massive construction operation continues at Mid-Pike Plaza on Rockville Pike, in the rapidly-developing White Flint area. The main shopping center building at Mid-Pike Plaza is officially closed to the public now, with only construction personnel and vehicle being allowed to physically access the property at this point. A separate retail center on the property, with a Starbucks, remains accessible to the public. 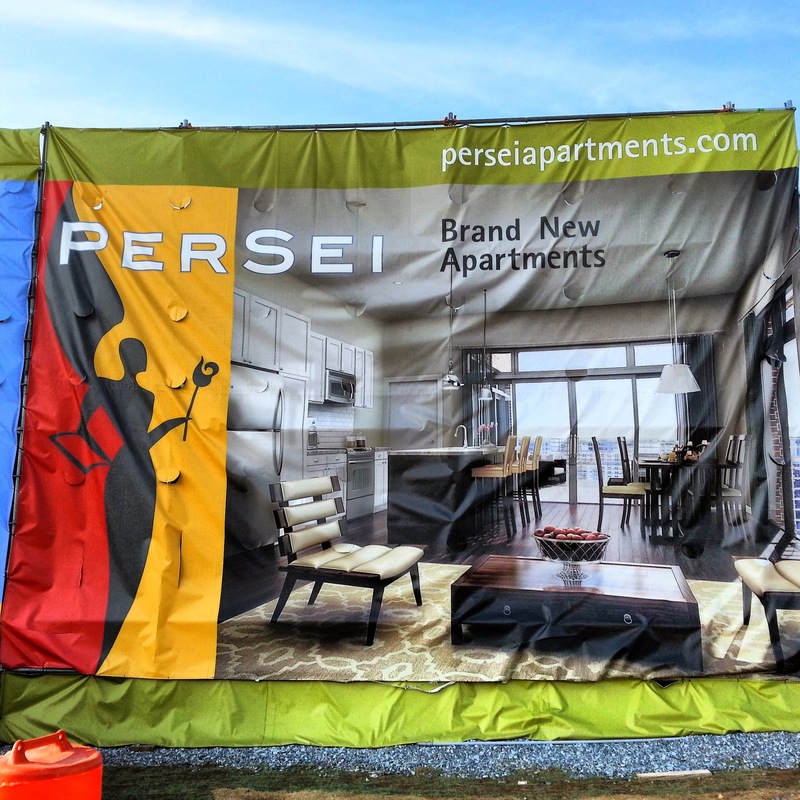 What you're seeing here are primarily two luxury apartment buildings (PerSei, delivering this year; and Pallas, delivering in 2015), an office building (11800 Grand Park Avenue), as well as the related retail, iPic Theater and parking facilities. 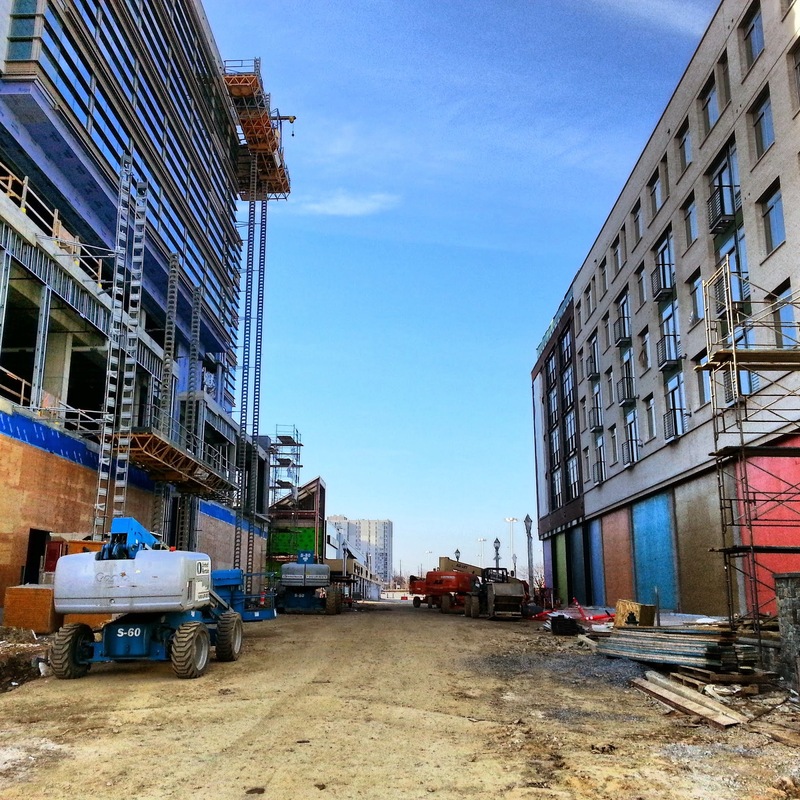 I'm still struck by how similar Grand Park Avenue (looks from Old Georgetown Road) to an early construction photo I have from Rockville Town Square. I think the reason for this, is that - temporarily - the scene in the distance is very similar. You have the canyon created by the buildings on either side of the street. But in the distance, flat ground, much like what is north of Rockville Town Square. 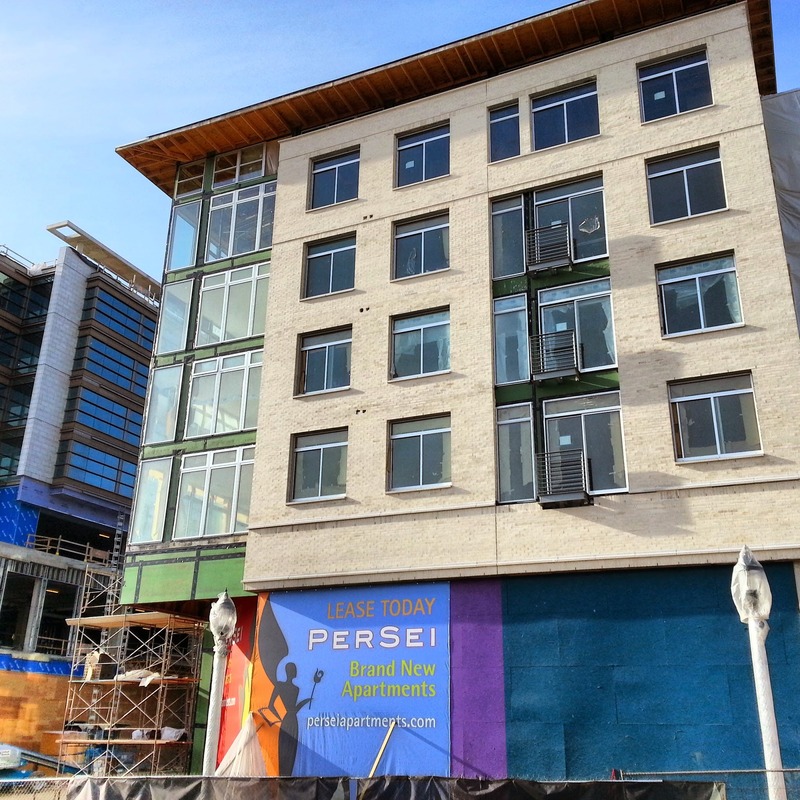 The outcome will be radically different at Pike and Rose, however. That is for one key reason: Federal Realty owns the land beyond these buildings, unlike the situation at Rockville Town Square. 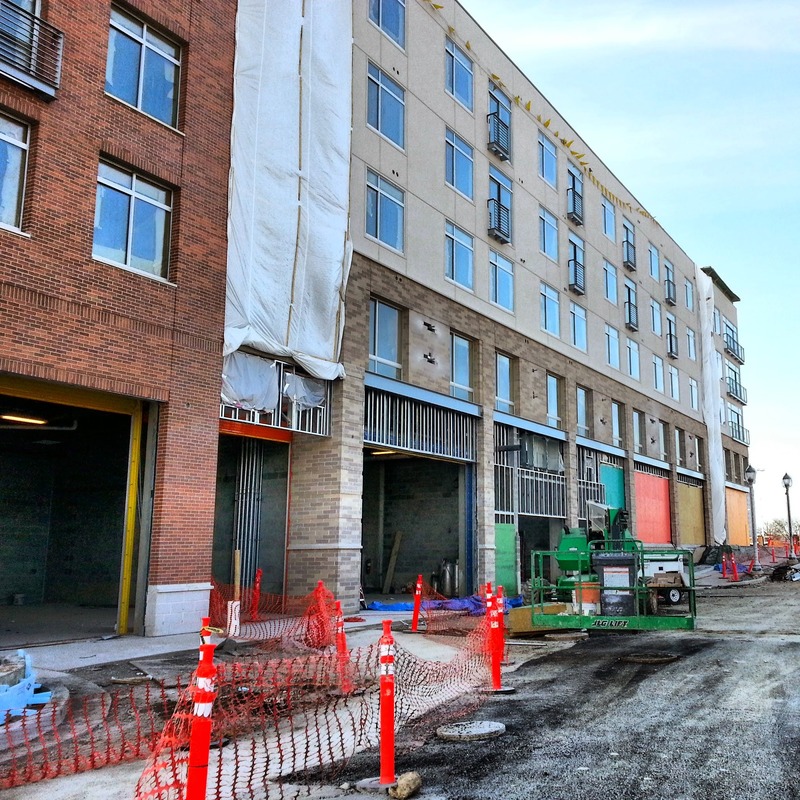 Whereas town center Phase II has stalled out in Rockville, the town center at Pike and Rose will be larger in scale, by the end of all phases of construction. BZzzzzzzz. 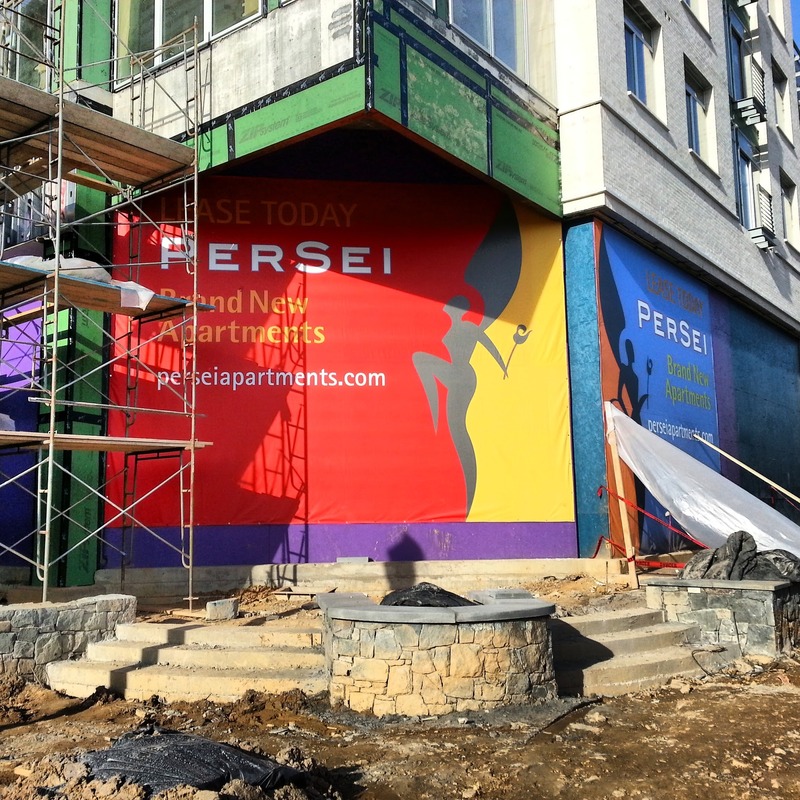 You'll be hearing that a lot in the months ahead around Rockville. Bee season is just about upon us, but the positive side of bees is the topic at a free presentation this Saturday, March 22, at Dawson's Market. 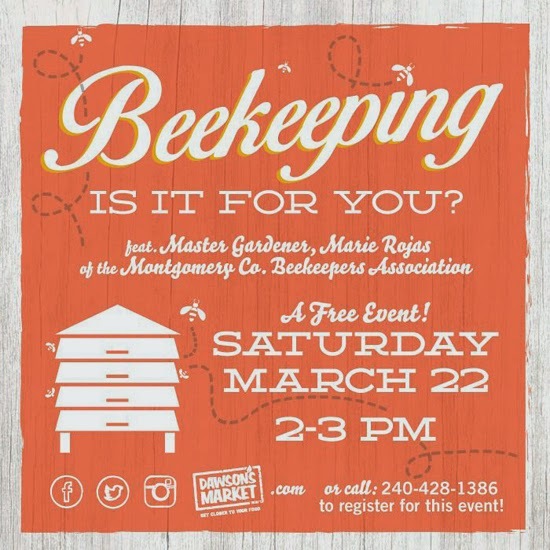 Come out to Rockville Town Square tomorrow at 2:00 PM, and learn all about beekeeping from an expert, Marie Rojas, of the Montgomery County Beekeepers Association. Find out what to expect in your first year as a novice beekeeper. Learn the tricks of the trade, like how to protect yourself, where to place hives in your yard, and the surprisingly complex behavior of bees. Afterward, enjoy a free tasting of local honey. Space is limited, so RSVP at customer service, or call 240-428-1386 to reserve your spot. David Thomas, a resident of Hungerford in Rockville, questioned the proposed increase in refuse fees in the draft of the city's next budget. Speaking at Monday night's Mayor and Council meeting, Thomas noted that funds were previously designated to be moved from the refuse fee funds to other expenditures. He said such a transfer "means you had plenty in the refuse fund at this point." The Rockville Development Review Committee will meet tomorrow morning, March 20, at 10:00 AM, in the Black Eyed Susan Conference Room at Rockville City Hall. On the agenda are two projects: a self-storage facility at 1175 Taft Street, and a 740 square foot addition to a child care facility at 850 Nelson Street. 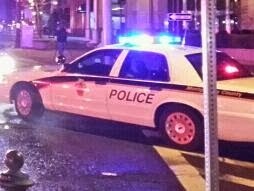 Rockville's city council last night voted to send a letter to District 17 legislators in the Maryland General Assembly, notifying them that the city supports the current ethics standards demanded of all elected officials in the state. Legislation that would alter the ethics reporting requirements is on the table in Annapolis. Councilmember Tom Moore, who has been a strong advocate of the tightened reporting standards adopted a few years ago, warned his colleagues to oppose any efforts to weaken the existing requirements. Mayor Bridget Newton said she believes some of the information demanded is beyond what is necessary or appropriate. Moore said every piece of property owned by a public official, regardless of how it was obtained or its geographic location, should be known to the public. A majority of the council agreed with Moore's support for the current law, voting 3-2 to send a letter backing today's standards to Annapolis. Voting in favor were councilmembers Moore, Julie Palakovich Carr and Beryl Feinberg. Opposed were Newton and Councilmember Virginia Onley. Some municipalities have opposed the recent standards, citing privacy concerns and a reduction in those willing to run for office and make such extensive disclosures. Others, such as Moore, have said having the full story on what a politician owns is essential knowledge for voters, in order to reveal any and all conflicts of interest. Theft. 2200 block McAuliffe Drive (Twinbrook Forest). Vehicle burglary. 1200 block Clagett Drive (Twinbrook). Assault/"other sexual offense." Richard Montgomery HS. Assault/"other sexual offense." Regal Cinemas Rockville. Drug arrest. E. Gude Drive at Taft Street. Drug arrest. 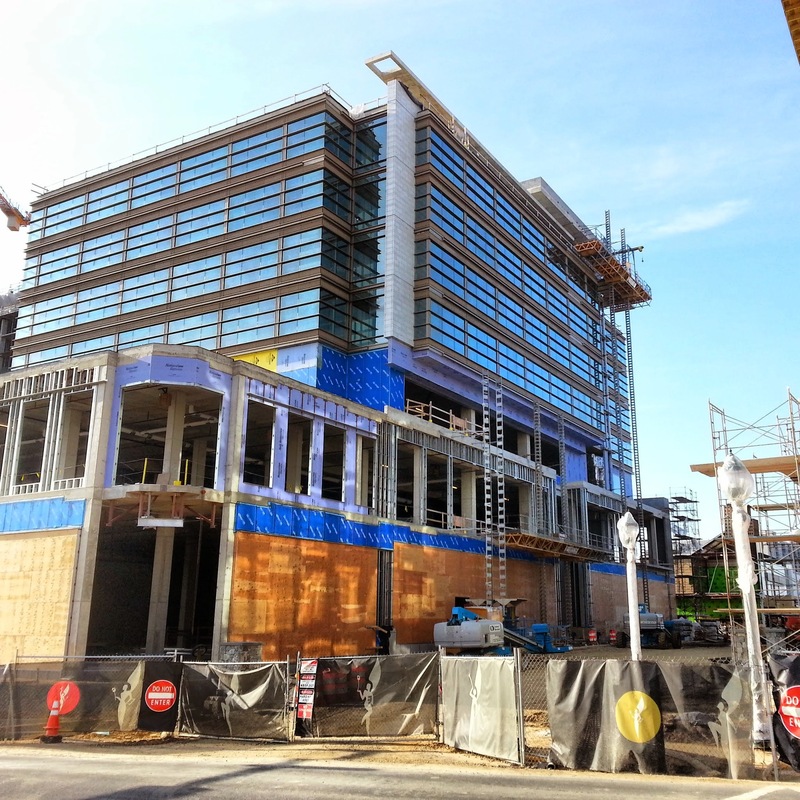 100 block Gibbs Street (Rockville Town Center). Disorderly conduct. 100 block Gibbs Street. Drug arrest. 1300 block E. Gude Drive. Drug arrest. Men's shelter, 600 E. Gude Drive. ROCKVILLE SNOW UPDATE - HOW MANY INCHES OF SNOW IN ROCKVILLE? A winter storm warning is in effect across the region today from 2:00 PM until 2:00 PM Monday. Rain is forecast to begin this afternoon, and change over to snow as the sun sets. The heaviest snow will fall during the overnight hours tonight. Currently, the National Weather Service is calling for accumulation of 5 inches, or more. Temperatures will be in the 20s overnight. Winds during the storm will gust up to 20 MPH, but average around 10. Highs on Monday will remain in the lower 30s, meaning travel will be dangerous, and road conditions could remain hazardous throughout the day. Stay tuned for updates on this very late winter storm. The Rockville Historic District Commission will not meet on March 20 at 7:30 PM. The reason for the cancelation was not given. No prospective agenda for the canceled meeting was provided. The print edition of Rockville Reports has proven to be the most popular form of communication between the city and its residents, despite technological advances and upgrades to Rockville 11 and the city website. 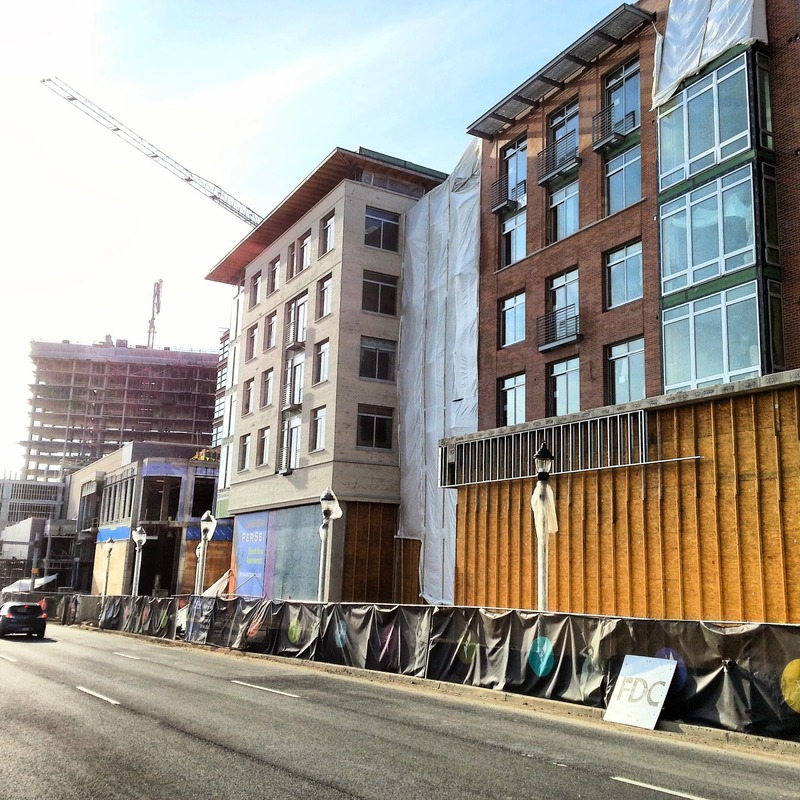 Now Rockville Reports is getting an upgrade of its own. Check out the latest edition online, with hyperlinks, video and a web-only feature: Q&A with the Mayor and Council. A front page story suggests that the Team Rockville slate councilmembers, and non-slate Mayor Bridget Newton, have found common ground regarding 8 issues facing the city of Rockville. Drug arrest. Meadow Hall Drive at Twinbrook Parkway. Drug arrest. 300 block Nimitz Avenue (Twinbrook). Theft. 9600 block Watts Branch Drive. Vehicle theft. 11700 block Parklawn Drive. Montgomery County is one of the first places in America to get a historic new sandwich from McDonald's: the new McDonald's Bacon Clubhouse. The Bacon Clubhouse can be ordered as a burger, or as a chicken sandwich (grilled or crispy). What makes the Bacon Clubhouse historic? It is the first time McDonald's has used its famous Big Mac special sauce on a non-Big Mac product. In this case, you're getting the special sauce on a quarter-pound, all-beef patty, with premium leaf lettuce, tomato, grilled caramelized onions, Angus seasoning, and thick-cut smoked Applewood bacon. One other big deal with this sandwich? The bun. The Bacon Clubhouse features a special new bun, which McDonald's is calling a "soft and warm Artisan roll." A shiny egg wash effect tops off the premium bun, which is slightly sweet in flavor, and has the toasted exterior and soft interior of a high-quality dinner roll. You can enjoy free food, and win a trip to Dallas for the NCAA Championship, by signing up at the Hooters Hooky website, and watching the games at Hooters of Rockville. Using coupons on the website, purchase a drink, and get FREE Buffalo chicken dip on March 14 and 15, a FREE fried pickle appetizer on March 21 and 22, and 10 FREE wings when you buy 10 on March 28 and 29. 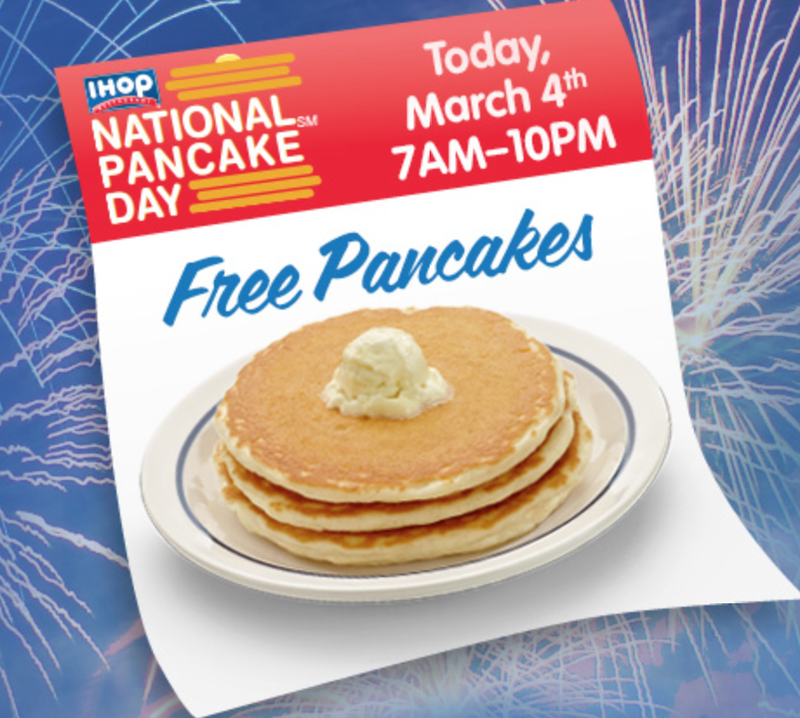 You'll automatically be entered into the sweepstakes when you register online. But each coupon you download, will score you another entry. Want to boost your chances even further? Post a photo of yourself with your favorite Hooters Girl at Hooters of Rockville on Instagram - with a #HootersHooky hashtag - and you'll get another entry into the contest. What's in the prize package? Airfare to Dallas, two-night hotel accommodations for the winner and a friend, $100 in Hooters bucks, a $250 cash card, Hooters merchandise and cash for championship game tickets. You'll also be invited to the Hooters VIP party at Hooters of West End on Sunday, April 6. Besides you, other VIP guests will include Duke veteran Jay Williams, Miss Hooters International Marissa Raisor, and 2014 Hooters Girl of the Year, Tyler Suess. 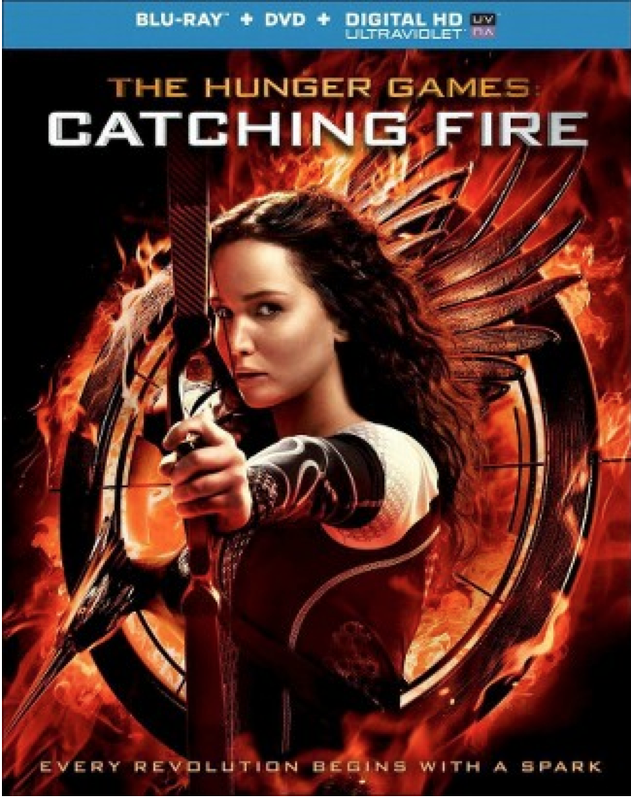 Friday is the big day for Hunger Games fans, as the second film installment hits stores across the country. 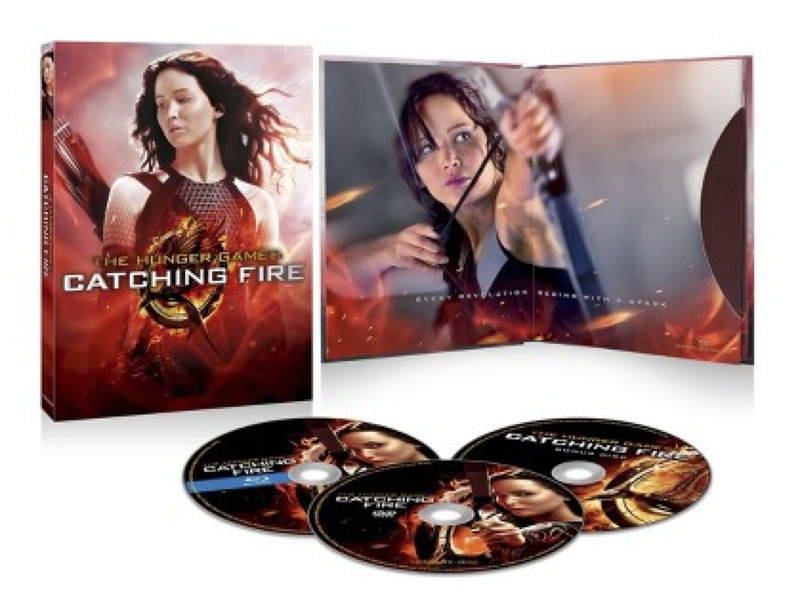 Catching Fire doesn't have quite the elaborate special edition packages the first movie did, but offers more than the average Hollywood blockbuster release in these days of dwindling bonus gifts. For collectors, it's all about the bonus pack-ins, and exclusive content and artwork. 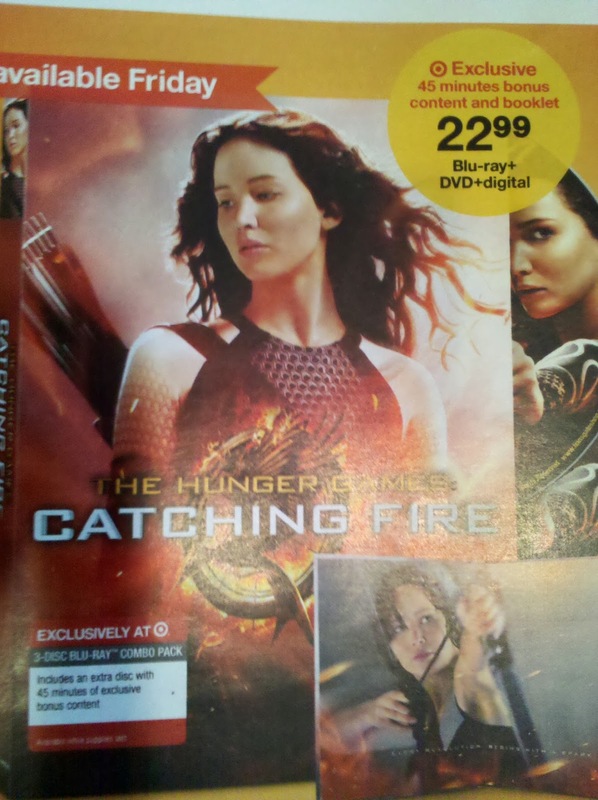 So, which store has the best Catching Fire Blu-ray/DVD package? In my opinion, it's Target. Not to mention that the Target edition appears to have the best cover design. And you get all of this for $22.99, more than you pay for many recent Blu-ray releases that had no collectible bonus items. 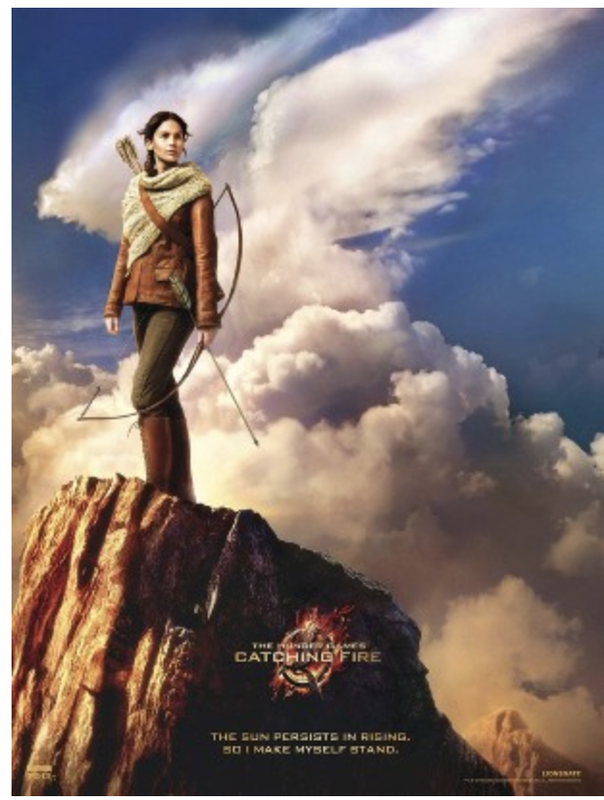 Walmart is second best, if you live near one that is opening at midnight tonight - the first 50 Catching Fire purchases will come with a Walmart-exclusive poster. Find a Walmart midnight opening event near you. The poster isn't new; it is said to be the IMAX theater poster from last November's opening. But that's it for bonus items, and Walmart has no exclusive bonus-disc content. The only other Walmart exclusive is a 2-movie set for the completist. Walmart has an online price of $19.96 for the Blu-ray/DVD. 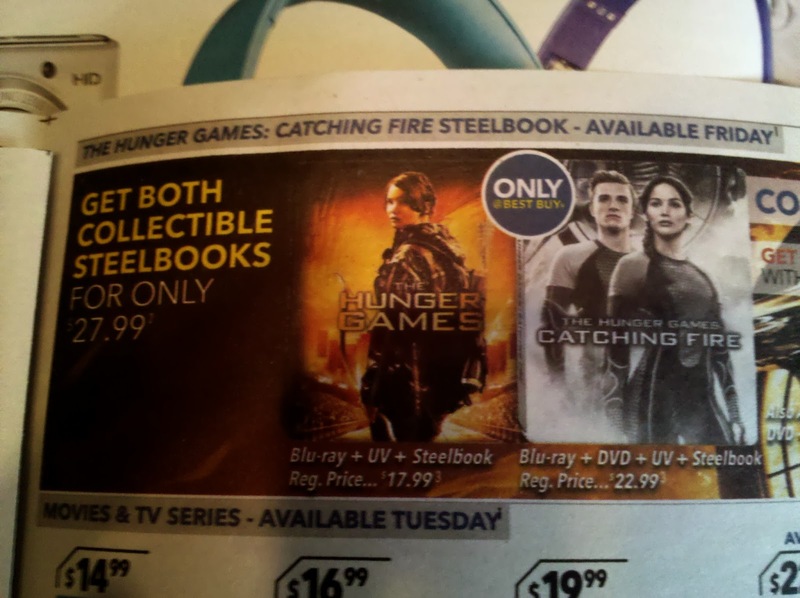 Best Buy's primary exclusive, is offering Catching Fire in the steelbook format. This is best for those who collect steelbooks in general, or, again, for the completist. If you're not near a midnight opening Walmart, bump up Best Buy to #2 on the list. The other 2 Best Buy bonuses that can bump it up to #2 are A) you can pick up the first Hunger Games Blu-ray steelbook version for only $5 when you buy Catching Fire, and B) you also get $8 in Fandango Cash, payable towards Divergent when it hits theaters on March 21. Best Buy's price is the same as Target. Zip, zilch, nada. Just the movie, that's it. 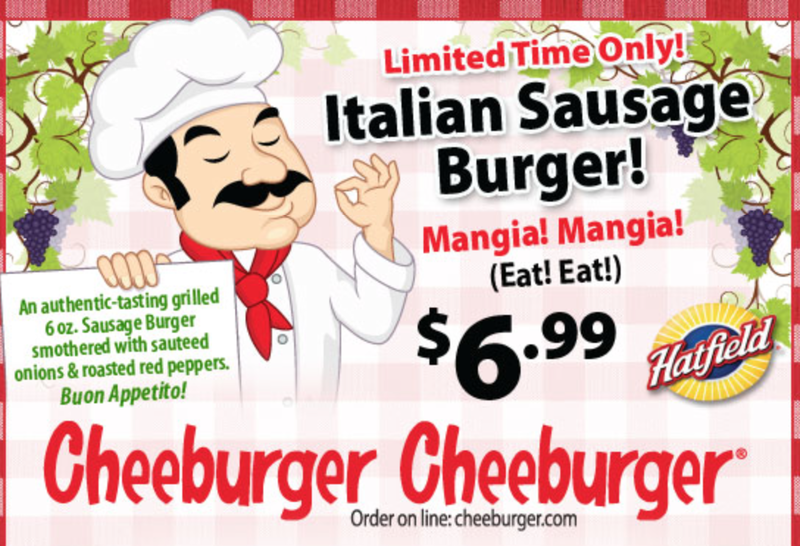 Cheeburger Cheeburger, located in the Fallsgrove Shopping Center on Shady Grove Road, has added an Italian Sausage Burger to its menu - for a limited time only. Enjoy 6 ounces of Hatfield-brand Italian sausage, topped with sautéed onions and roasted red peppers for lunch or dinner today, at Cheeburger Cheeburger in Rockville. Then head through the drive-thru at Krispy Kreme for dessert!